Finally, a beautiful morning on the beach! 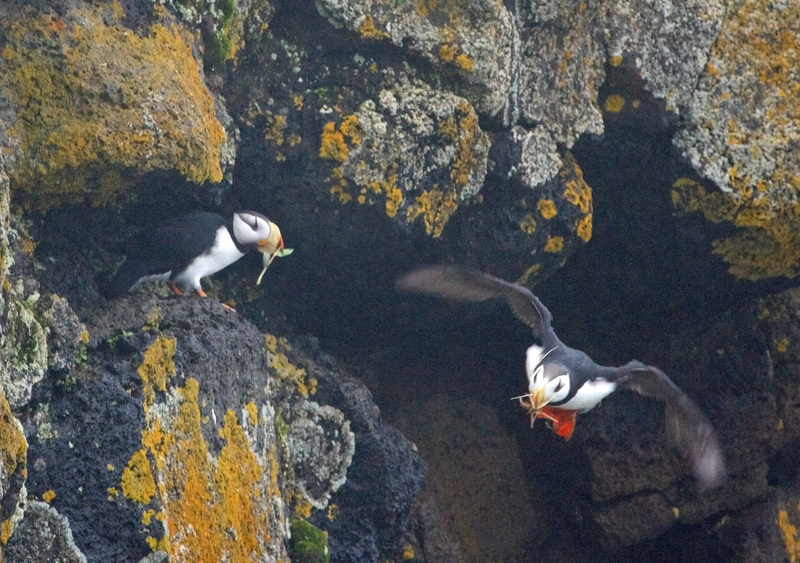 Mild winds, warmer temperatures and bird activity. The yellow-rumped warblers are still everywhere but getting handsome. Walking along the beach at the North End of Tybee, the first thing that caught my eye was a large gull that seemed way too white. 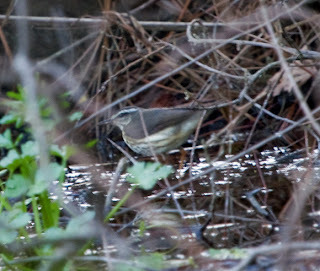 I studied all the features - no black in the tail, large bill, very pale gray mantle and a light colored eye. 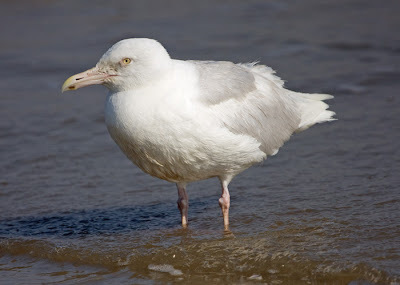 Could it be a Glaucous Gull? 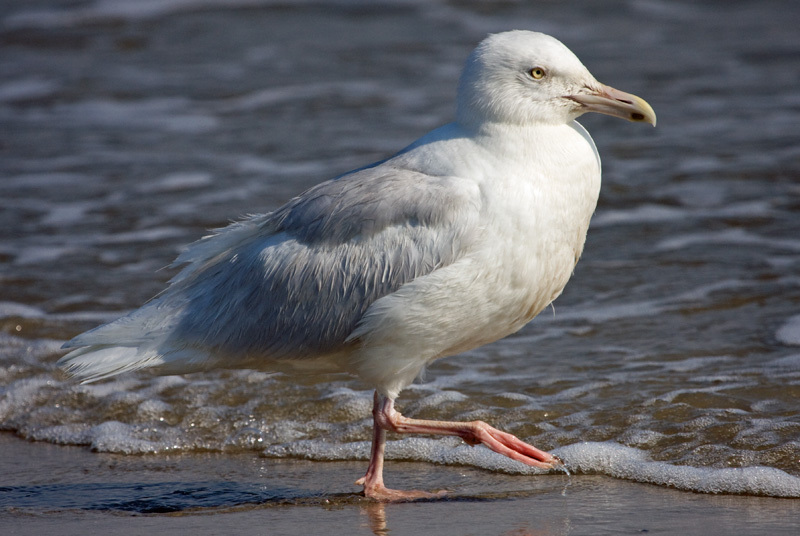 After taking many pictures and consulting my Sibley as well as a couple of other references, I concluded that Yes, this was indeed a Glaucous Gull. Glaucous Gull - note all white wing tips, light mantle, heavy bill and light eye. 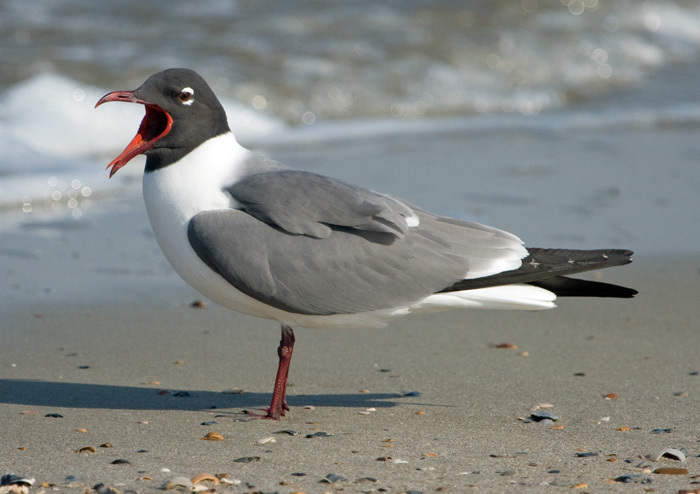 Also of interest on the beach were the Laughing Gulls in their snappy breeding plumage, already "laughing" loudly. A couple of Bonaparte's Gulls were hanging out as well. 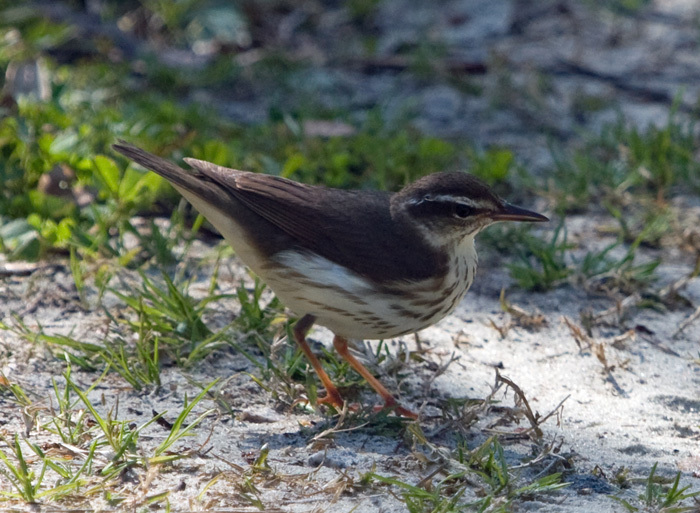 On the way back from the beach, a waterthrush walked out onto the path and bobbed its way along ahead of us. I studied and studied but don't quite know which to call it. 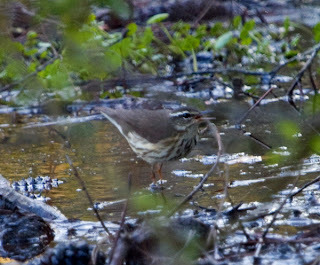 The eye stripe was long but did not seem to get wider at the back end. The throat was clear and unstreaked which would indicate Louisiana. I would be grateful for input from other birders. Please join me at Barnes & Noble in the Oglethorpe Mall on Saturday, April 20 from Noon until 2 pm. 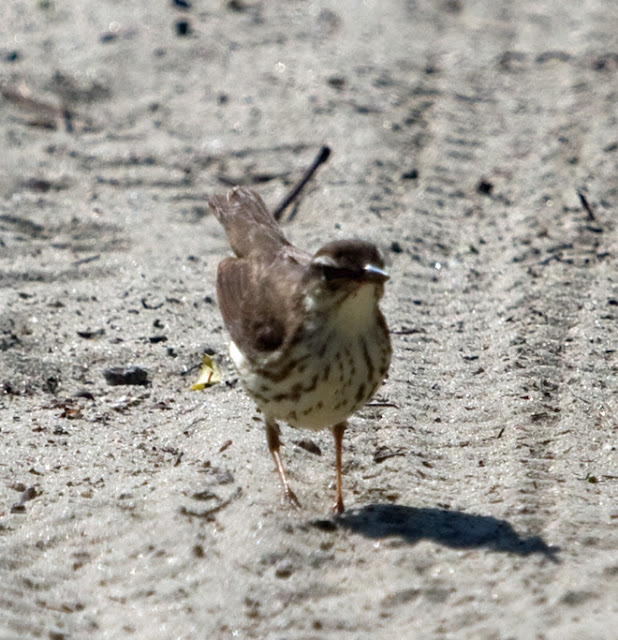 I'll be happy to attempt to answer your bird questions...(bring photos!) and sign copies of my book. by Dot Bambach, Sandy Beasley and myself at 7 pm at First Presbyterian Church on Washington Avenue. Hope to see many of you there! Well, I set out on Sunday morning to find signs of spring. 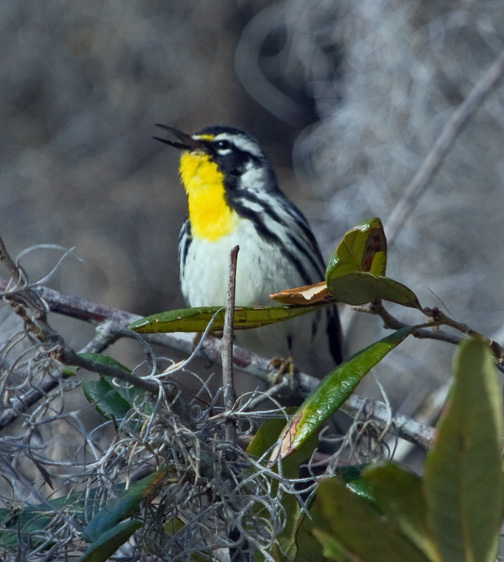 The first thing I noticed was a lot of song – cardinals crooning, the brown thrasher doing his couplets from atop the oak tree, the red-bellied woodpecker drumming on metal on the telephone poll, and the wonderful wandering warble of the yellow-throated warbler. 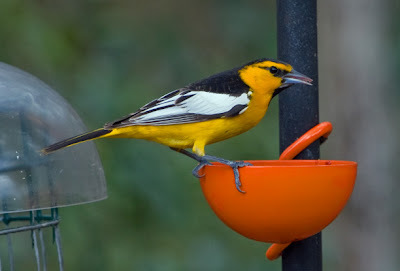 After watching gnatcatchers flit about, dozens of yellow-rumped warblers, and hearing the red-breasted nuthatch, I head for the Unitarian Universalist Church and then down to Hinesville where my friend Nicole had an extra-special bird visitor – an adult male Bullock's oriole. I arrived about 1 pm to find that the oriole had visited at 12:15 and again at 12:45. 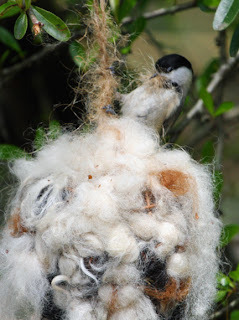 While waiting for him to reappear, I enjoyed watching the Carolina chickadee gleaning fiber from the twine hanger of a nest ball. At about 1:35, the oriole made a brief appearance, slurping up some grape jelly before flying up into the magnolia. Gene Keferl from Brunswick timed his arrival perfectly as the bird showed up about 5 minutes after he did. We waited around for another viewing, which came about 45 minutes later. More signs of spring were to follow. On Monday morning, Tim Miller called to report a First of the Season for him swallow-tailed kite in Effingham County. On Tuesday evening, a northern parula – my first this spring – visited my birdbath. 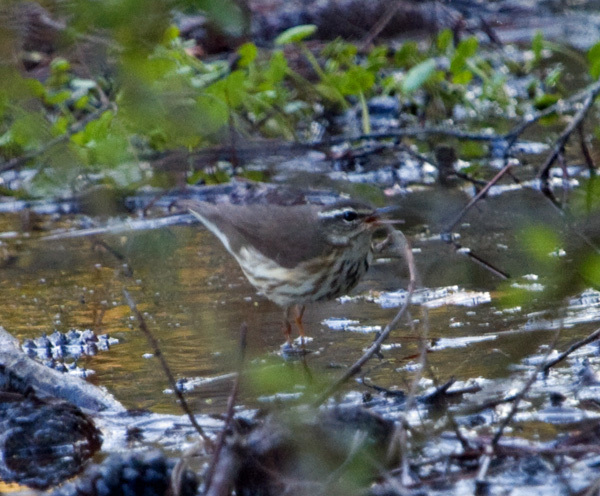 Then on Tuesday evening, my friend Connie and I found a Louisiana waterthrush in the wet area at the back of her Talahi Island property. I was thrilled since many years the Louisiana waterthrushes slip through early and I miss them completely. 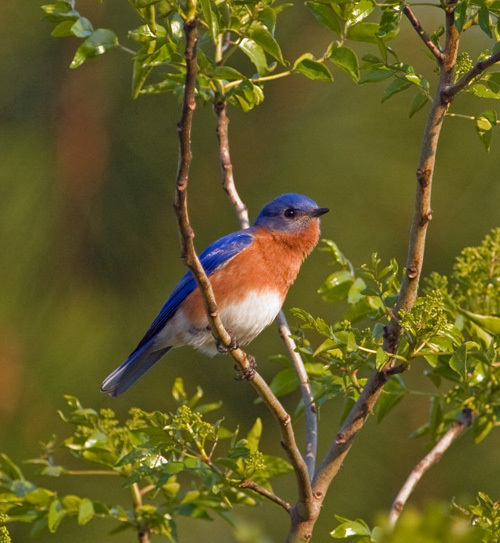 Of course, it wouldn't truly be spring without the soft warble and brilliant color of the male eastern bluebird. This handsome fellow was hanging out near a box on Pinckney Island. His date was nearby on a fence. I can't wait to see who will show up next!